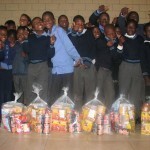 2010 – a great year for FEED SA and its charities! FEED SA have been working for the past eight months to secure sponsorship to support these 336 vulnerable kids who come from families where parents are absent and these kids are raised either by their grand parents, aunts/uncles and in some cases, even elder siblings. After 8 long months, we have successfully secured sponsorship and the feeding scheme has been launched. Our grateful thanks goes out to Lesego Mosetle, who runs the Rutegang Munsiville youth Organization ( RMYO ) , who has played such an important role in the organization and arrangements of the necessary details of this feeding scheme. The launch took place at the Munsieville Community Hall and was attended by our wonderful and generous sponsors – Silverstar Casino and Gammatek, as well as by the kids, the school teachers and the principals. The pupils were all from schools in the Munsivill area, namely Diphalane Public school, Phatudi primary School and Thutolefa Secondary School. These children were receiving their only meal for the day at school, and when they went home, there was no means with which to get food, hence going to sleep on an empty tummy an off to school the next day with out any breakfast. NO more homework, NO more studying, NO more attending school – ON AN EMPTY STOMACH! 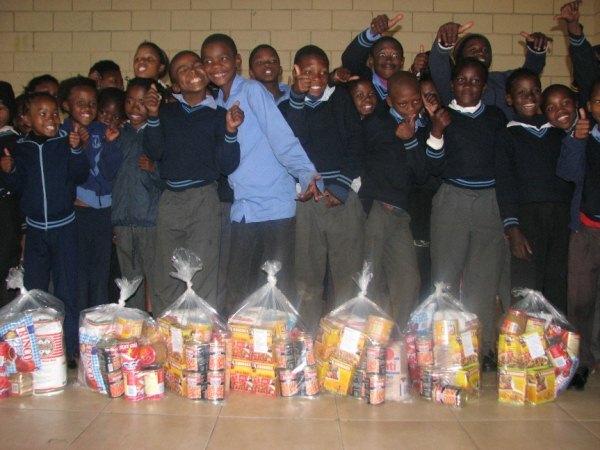 Once a month, these 336 children will receive a food parcel which they take home for food for the month! To serve the community further, FEED SA will be purchasing the items from Monos Supermarket, a SME in the Munsieville Township, who will be packaging and delivering each hamper to the relevant schools. FEED SA extends a HUGE thank you to The Moriah College preschools in Australia – who were very kind in allowing a 4 week campaign to raise funds for FEED SA – and to adopt Rhonda’s Day Care.. one of FEED SA’s beneficiaries in Alexandra Township. Honey cup cakes were baked at Our Big Kitchen -a huge kosher community kitchen designed to help those in need . These delicious treats were a huge hit in the sales market! Lance from Drum Circle Events – volunteered 2 full sessions with their Bondi Rd campus and Randwick campus. Each child had a chance to participate in group drumming and rhythm and music. Everyone had so much fun! This has been such a successful fundraiser so far, and we are thrilled and grateful to announce that the Moriah Schools have decided to continue with the fundraising for FEED SA. FEED SA at the PWEE Event – 14/09/2010. FEED SA was nominated as charity of choice for the PWEE event, held on September 14 at The Venue, in Melrose Arch. We were presented with a cheque for R20 000! The event was a HUGE success, which was for the Promoting of Womens Economic Empowerment, hosted by Colleen Luck. FEED SA was proud to be a part of this event – priding ourselves in our part of empowering the amazing and passionate ladies/teachers and care givers that we assist on a daily basis. Dr Johm Demartini was there too, giving a talk on relationships and bringing balance to life. All in all the night was that of fun, laughter, upliftment and empowerment – AND of course, more exposure for FEED SA! MANY thanks to Colleen Luck for her amazing, kind and generous donation to FEED SA! 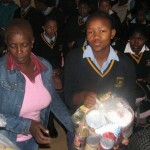 FEED SA hosted an Easter Party for a few of the crèches they assist in Soweto and Orlando West. The event was held at Uncle Tom’s Community Centre in Orlando West, a venue that will most definitely be utilised by FEED SA for all future events !! The children had the most wonderful, fun filled day – inclusive of jumping castles, horse carousels, ferris wheels, personally made balloons, candy floss, arts and crafts Easter egg painting, ice-cream, hot dogs from Rory and 1st Hot Dog Company – and much more !! The halls were filled with laughter and joy throughout the day! FEED SA started our first teacher training yesterday (8th of April) at King David Nursery School in Linksfield. 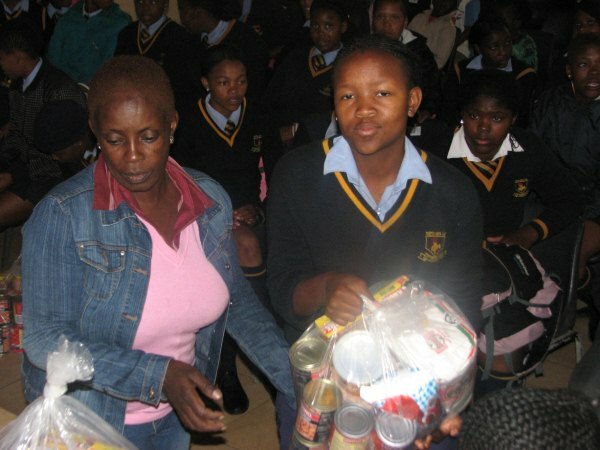 Part of the FEED SA incentive, is to further educate these special, passionate and determined women who run these crèches in the townships that we support through our feeding scheme. FEED SA has made it compulsory for the those who have no training or qualifications – as well as for those who DO have some form of training, to attend these four, full day courses which covers arts and crafts, music, skills for fine and gross motor skills, cognitive development, Child Development and visual art, story telling and puppet making. Thank you ladies for your time, your kind, generous and genuine support, as well your warmth and determination that went into this training. Our ladies absolutely loved it – and each one went home with so much information, enthusiasm and encouragement – full of positivity and smiles! FEED SA is so proud to assist these incredible and ambitious ladies, who run their crèches with so much pride and love – and we feel blessed to know that we can and DO make a difference in the lives of these wonderful people… and we shall continue to do so. FEED SA – with the kind and generous assistance of Blue Label, arranged a fun and festive Christmas for some of their creches in Soweto, at Mostoaledi Pre School in Soweto… the kids had such fun, on merry go rounds, and jumping castles, with candy floss and popcorn, slush machines and hot dogs and lots and lots of sweets !!! Father Christmas ( one of the staff at Blue Label )! – handed out all 200 specially wrapped presents, all personally wrapped by Jo-Anne and Justine !!!! The kids were so thrilled and so excited. They had balloons made by the special balloon “makers” and thoroughly enjoyed this different and fun experience. It was truly a day to remember – and thanks to Mr Sweet for the yummy sweetie packs we wrapped for the kiddies to take home !! 620 Kids from the Phutaditjaba Community Centre in Alexandra Township were given the wonderful opportunity to celebrate a memorable, fun, festive, delicious and entertianing Chirstmas – filled with lots of fun things to do – special rides to go on and yummy treats with which to fill their tummy’s !! FEED SA managed to organize the wrapping of all 620 gifts, which was not an easy task, but certainly a pleasant and rewarding one. The kids played all day, thanks to Clamber Club, jumping castles, stilt walkers, 1st Hot Dog Co many more fun things…. They were so excited to have candy floss,popcorn, slush and hotdogs – all in all they had a fabulous time. Laughter and screams of joy was heard throughout the day ! Each child has their very own balloon made, by the balloon stilt characters – and they were very in awe and glee of this amazing balloon “maker” ! Many of the kids spent the whole afternoon with Clamber Club, climbing and crawling and balancing and doing little “field trips” amongst all the different colourful equipment… this was a huge favourite amongst many !! Towards the very end of the afternoon, each child was handed a “surprise sweety bag” which was filled with crayons and some juice, some crisps and some chocolate treats to have for home. What fun it was to spoil these special little souls and to share in their special and uplifiting experience…. It was a Christmas to be remembered with a big smile ….. HUGE THANKS TO DISCHEM FOUNDATION AND MR SWEET and MANTIS SECURITY ! 3000 Senior Citizens from the Phutaditjaba Community Centre in Alexandra Township gathered in Marquees along 17th street in Alexandra to celebrate Christmas with a deliciously cooked luncheon and some very exlcusive entertainment. Mr Linda Twala, the Community Leader in the township, managed to arrange the closing off of the streets and the citizens were treated to an amazing and memorable day. Stages and lighting, seating and outside restrooms were all part of the arranging and set up. Many different well known entertainers from the community, including dancers, choirs, bands and tribal dancers amused and entertained the audience the whole afternoon – there was never a dull moment !! Lunch was served, deserts and cakes were eaten and the festive spirit of Christmas danced around the air. Each citizen was seated in the marqee and personally handed a big food hamper to take home with them . Speeches were deliverd, certificates to those who made a difference were handed to certain people and the day was a joy to remember !!! The joy of giving, is sometimes in the receiving… for the smiles that were worn on the faces of these senior citizens were contagious…and priceless.